Along with roof and floor trusses for any application, Truss Fab provides engineered i-joist products, along with a full line of LVL Beam and Glulam products. Our 35,000 sq ft shop capacity allows us to store product inside, away from harmful outside elements. 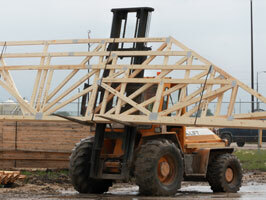 All of our trusses are made with a MSR quality grade lumber to ensure proper fit.